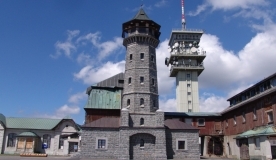 It is the largest ski resort in eastern Germany. Apart from the slopes and ski tracks there is also a ski-jump, snow park and snow tubing trail. You can choose from a total of 9 slopes of varied difficulty. There are also different buffets, rentals, ski schools and children’s ski schools.